Your car isn't just any car, it's your investment. Whether you drive a new car, a lease or an old vehicle, your investment needs to be protected! An accident can result in severe structural damage, but even if it's a small one, you'd still want body repair experts working on your car, using state-of-the-art unibody and frame repair equipment. Auto collision repair goes beyond fixing structural and body damage, it also includes paint and refinish. At CARSTAR #15394 in San Rafael, CA, we give you options, from expert color matching to paintless dent repairs if possible. Our expert technicians and QAs will also run extensive quality control and assurance inspections to make sure you're getting your car back in excellent shape. Although the name may seem pretty self explanatory, when repairing a vehicle after an accident, there is much more to a proper auto collision repair process. First, it should start long before your car is being worked on - it should start the moment you call in the accident. Arranging for a tow service, liaising with your insurance, assisting with car rentals; these are all things your chosen auto collision repair shop should be helping you with. Once you and your car have safely arrived at the shop, the process starts with an extensive damage assessment, which can sometimes mean vehicle disassembly to find any hidden damage early on. Structural and body repairs are the next step of the process, followed by paint and refinish. Even then the process is not complete, as expert QAs need to run quality inspections to make sure your vehicle is returned to you in perfect shape. Learn more about how auto collision repair works by contacting CARSTAR #15394 in San Rafael, CA. While assistance at every stage is important and having options when it comes to choosing auto body services also has its benefits, those are not the most critical touchstones when it comes to having your car fixed, are they? What you want first and foremost is to know that your car is in the best of hands and that's our promise at CARSTAR #15394 in San Rafael, CA. We have expert technicians, experienced QAs and highly advanced unibody and frame repair equipment. Our technicians have the right experience and skill set to work with both structural and body frame damage and will always be able to create the best repair plan for your car. We conduct quality inspections both for control and assurance, so when your vehicle is at CARSTAR, you know it's in good hands. At CARSTAR, you'll find more than auto collision repair services. We take the same comprehensive approach even if your vehicle has not been involved in an accident. If all your car suffered from are minor dents and dings, we provide Paintless Dent Repairs, a great way to freshen up the look of your vehicle without a major investment. We also offer Fleet Services that handle any size or type of fleet while keeping your costs low. 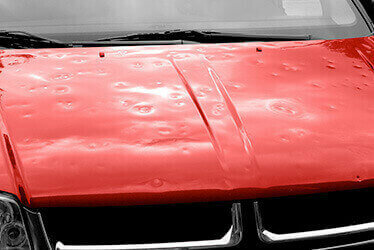 When nasty storms strike, you'll find Hail Damage Repairs at CARSTAR #15394 in San Rafael, CA as well, so you can get back on the road as soon as possible. Contact us today to learn more about the range of services offered near you.